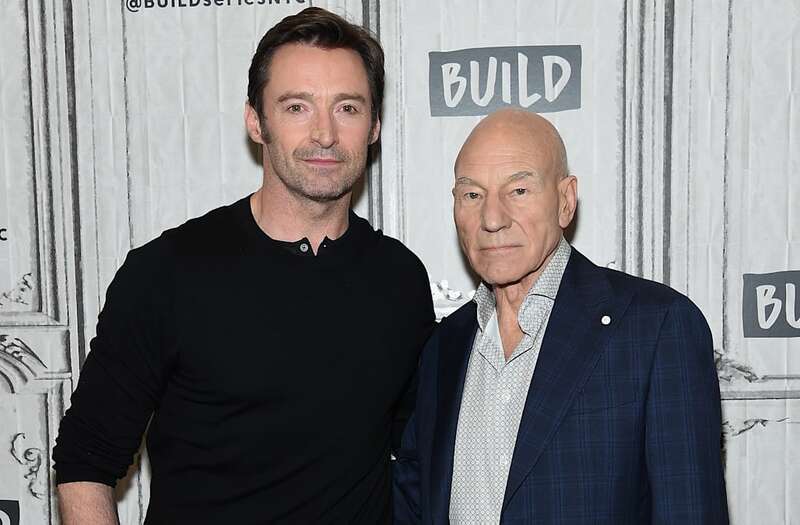 Actors Hugh Jackman and Sir Patrick Stewart stopped by AOL's BUILD Series to discuss and promote their respective roles in the highly-anticipated latest film in the 'X-Men' series called 'Logan'. This particular 'Wolverine' film has a different vibe to it in comparison to the previous two films, 'X-Men Origins: Wolverine' and 'The Wolverine'. It takes place in the future this time around and Jackman's character Logan has to take care of Stewart's character, Professor X as well as protect a mysterious 11-year old girl named X-23 a.k.a. Laura. They have to continue to do whatever it takes to defend against the new threats. Jackman and Stewart were emotional before production began and after the film's world premiere recently at the 2017 Berlin Film Festival respectively because they knew it was their final time playing these iconic characters. "This would be the last and so in this movie is everything I ever wanted to say, felt in my heart, saw in my head with James Mangold (director). It's doing a movie that I hope my grandkids (if I have them), 20-30 years from now will say 'Oh grandpa, which movie should we see? I know you did nine. ', and I was like I wanted to stood definitively off that CD or DVD shelf to say 'Watch this one, uh...when you're old enough! ', proudly stated Jackman. As for Stewart, it wasn't until a few weeks ago that the notion of him not being in anymore 'X-Men' movies hit close to home for him. "We were in Berlin screening the movie, its world premiere at the Berlin Film Festival which was for both of us, a thrill because it's one of those iconic festivals that REALLY takes movies seriously. We were sitting side by side and we were into the last few minutes in the movie and I suddenly felt something and Hugh had taken my hand and was squeezing it and then I saw him go like this [Stewart reenacts by wiping a tear from his eye] and I go 'Damn it, if Hugh Jackman can wipe away a tear, so can I!' Then the credits rolled, we were sitting there watching them and it simply floated into my head, 'Will there ever be a more perfect way of saying 'au revoir' to this series? No, unlikely! How can there be?' I was back in the car thinking, 'That's it!'. I feel perfectly content with that decision. ", explained Stewart. The 'X-Men' film series has made Jackman and Wolverine and Stewart and Professor X seemingly synonymous to each other amongst pop culture enthusiasts and comic-book fans alike. However nothing lasts forever and it's likely we'll see more reboots and spinoffs of Wolverine in the future with new actors playing said characters. Jackman was content with what was made over the past 17 years citing it as a "gift of a part". "I will always love Wolverine! I will always love the fans. I've always given it 120%. I've worked with people I now call my friends, some of the best actors and directors in the business. It is a gift I don't deserve -- honestly I don't. I have such gratitude for it but only when I saw that final film. My gratitude for James Mangold I could never repay because no film has meant more to me than this film. No film has felt more personal and I did cry. A lot of that was really like, ' Yeah, that's the character I felt in my heart'. That is the version of the story I wanted to tell. So I now rest easy." Stewart teased the audience that maybe someday we'll see him reprise his role as Professor X in a Broadway show. "I have been, first teasingly, then increasingly seriously pitching a Broadway idea to Hugh here. I think each time I do it, I think he listens a little more carefully. But that is of course, all I can say. But it would be a musical." Hey, anything can happen! Maybe Mangold would reunite with the two of them and would direct this musical someday! Meanwhile, see the drama unfold in the intense, action-packed movie, 'Logan' which hits theaters Friday, March 3rd!